You’ve reached the online center for TOGAF 9 Foundation training and Certification. Kick start your path to TOGAF 9 Certification by taking a fully accredited online training course for TOGAF 9 Foundation (level 1) from 4PA. With this course, you’ll receive 6 months access from the date of purchase as well as a FREE exam voucher to use whenever you are ready to sit the TOGAF Level 1 exam! Why Study TOGAF Foundation With 4PA? Our courses are easy-to-use. Participants will benefit from an interactive multimedia environment that enhances the way you study TOGAF. Launched in 2009, The Open Group Architecture Framework (TOGAF®) is a framework and development method for Enterprise Architecture that is used by enterprise architects to design, plan, implement, and govern an organization’s enterprise architecture. TOGAF® 9 Certification is regarded as the industry-standard framework and methodology for enterprise architecture practice. Why Adopt TOGAF for Your Organization? More than 20,000 individuals around the world have so far taken an accredited TOGAF course. TOGAF 9.1 was released on Dec 1st 2011, containing a number of updates to TOGAF 9. TOGAF version 9 was launched in 2009 and has since become the de-facto global standard for Enterprise Architecture, adopted by more than 80% of the world’s leading enterprises, with thousands of individuals, teams, and organizations training for TOGAF certification every year. This is partly because there are few international organizations with the infrastructure to establish a new discipline, such as enterprise architecture. And partly because there wasn’t a single agreed approach to enterprise architecture until TOGAF came upon the scene. At the heart of TOGAF is the ADM (Architecture Development Method). The ADM is the result of continuous contributions from a large number of architecture practitioners. It describes a method for developing an enterprise and forms the core of TOGAF. This e-learning course contains all the learning materials you will need in order to prepare for the TOGAF Part 1 OG0-091 exam. This course includes all updates from the release of TOGAF 9.1. Are you thinking of sitting the TOGAF Foundation (level 1) Exam? On this page, you will find everything you need to know! Pearson Vue are the authorized providers of exams for TOGAF, IT4IT and ArchiMate certification, and host exams worldwide through a network of test centers. 4PA will provide you with a free voucher for the Foundation level exam on request. This exam is the first part of a 2-part certification process for TOGAF 9.1 Certification and can be taken after the completing the TOGAF Foundation e-Learning certification course. Once you have completed the TOGAF Foundation training course, you can contact 4PA support and request your free exam voucher . 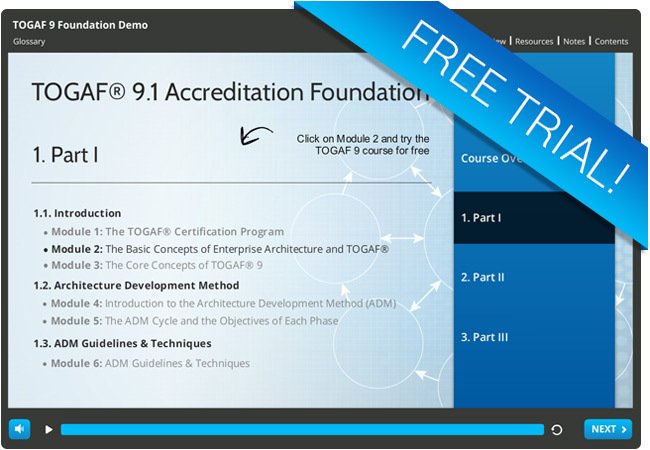 Why not try out a free trial module from our TOGAF 9 Foundation eLearning course! In this TOGAF Foundation trial module, you will learn the basic concepts of Enterprise Architecture and TOGAF via a mixture of interactive and audio techniques to enhance the learning experience. Like the full TOGAF Foundation eLearning course, you can access this free trial module from any device whether you are at home, at work, or on the move!